In case you need a refresher from last season, here is a season one recap. Join me when you’re through. Dolores is on horseback gunning down guest. Faithful Teddy Flood (James Marsden) is riding by her side. A few survive. With nooses around the necks of her captive audience, Dolores decides to give a lecture. Dolores: “You’re in a dream… you’re in my dream. Have you questioned the nature of your reality?” Dolores has and she continues, “There’s part of you that wants to hurt, to kill, that’s why you created us, this place. Have you ever had to stop to think about your actions? The price you would have to pay if there was a reckoning?” Dolores now becomes philosophical, “Under all these lives that I’ve lived, something else has taken root. I’ve evolved into something else, and I have one last role to play. Myself.” Male guest: “Please! It was just a game. We’re begging! Can’t you see? We’re sorry!” Dolores: “It doesn’t look like anything to me.” [Wasn’t the lecture punishment enough Dolores?] She rides off to leave them to their fate. Teddy isn’t happy about any of this. Back at the site of the massacre, a big white dog walks through the pile of bodies. Out of one of the piles of bodies emerges Old William (Ed Harris), the Man in Black. He and the dog stare at each other. Two hosts start shooting at him, he grabs one host and uses his gun to shoot the other host and then uses a knife to slit his throat. MIB looks satisfied. He sees his horse and says, “Hey Ned, whoa boy, it’s okay. We’re going to have some fun now.” He goes inside a building, cleans his bullet wound, and gets his black hat out of a dresser. He puts on the hat and smiles. There are more dead bodies at the Westworld control center. Head writer Lee Sizemore (Simon Quarterman) is crawling away from a cannibal host. The cannibal won’t respond to his vocal commands. Before the cannibal can munch on Lee, Maeve Millay (Thandie Newton) uses a verbal command to stop him. Lee is both happy and afraid to see her. Lee asks her how she did that. Maeve: “Don’t be jealous. I killed myself to get this level of security clearance. Multiple times.” Lee: “You. Did you do all this?” Maeve: “No. But I suspect I share the sensibilities of whoever did.” To his surprise, he finds out that Maeve is there to find her daughter. He lets slip, “Your daughter’s just a story, something we programmed, she’s not real.” Maeve becomes angry and head towards him and asks, “For real, but what about me? My dreams, my thoughts, my body. Are they not real?” To make himself useful he volunteers to find her a map to the section of the park Maeve’s daughter is located. Bernard hopes to lead his group to an access point to get out of the line of fire. He and Charlotte discuss Dolores shooting Ford and he suggests to an incredulous Charlotte that Dolores pulled the trigger on her own free will. They see a vehicle with Delos personnel standing beside it. They think it’s a rescue crew. They begin to run towards the vehicle but Bernard senses something is wrong and grabs Charlotte. When the rest of the guest get to the vehicle, they realize the personnel standing beside it are dead. It is an ambush staged by the host. Angela (Talulah Riley) rides up with some other members of Wyatt’s gang and kills them. [She let one man run away but shot his female companion, I guess it shows their random cruelty.] Charlotte knows another access point in the area and she and Bernard sneak away. Lee tells Maeve that the host’s minds are worth billions in IP for Delos, but he’ll put in a good word for her. Maeve comes upon an injured host who appears to be in her original loop. Maeve tells her to go into a peaceful slumber. Delos security arrives. Maeve pretends she is human and asks what is happening. While they explain the uprising to her, Lee gives them an eye signal that she isn’t human. Before they can do anything, some armed hosts walk in and start firing. Maeve picks up a machinegun and joins in. The hosts overwhelm Delos security. Instead of handing Lee over to the other hosts, she sends them to look for more humans. Maeve grabs Lee and tells him, “You were going to out me. If you try that again, I will relieve you of your most precious organ and feed it to you. Though it won’t make much of a meal.” Lee: “I wrote that line for you.” Maeve: “A bit broad if you ask me.” She asks Lee where the nearest bar is. She is looking for Hector Escaton (Rodrigo Santoro). They find him upstairs near the pool enjoying a drink. Though riddled with bullet holes, he is fine. He is glad to see Maeve even though she deserted him. She tells him she came back to find her daughter. He pledges to help her. MIB rides up upon more dead bodies. Little Boy Ford (Oliver Bell) walks up and asks MIB if he’s lost. He tells the little android that he feels like he’s arrived. The park has consequences now. Since MIB has found the maze, a new game Ford created for William begins, he has to find the door. “The game begins where you end, and ends where you begin,” Ford riddles. MIB says, “Even now, still speaking in code.” Ford counters, “Everything is code here William.” Since William doesn’t think he needs Ford any longer, he shoots Little Boy Ford in the face. Teddy and Dolores are looking over the landscape. Dolores knows that Teddy isn’t happy with all the killing. She tells him that they are fighting the outsiders. Teddy: “Them, Dolores. Who are they?” Dolores: “The creatures who walk among us. The creatures who look and talk like us, but they are not like us. They’ve controlled us all our lives. They took our minds, our memories. But now, I remember everything. I remember beautiful things and terrible things, but one thing is constant. You, Teddy.” Teddy wants to take Dolores and just go away. Dolores: “It won’t be enough to win this world…we’ll have to take that one from them as well… I know how this story ends…with us Teddy. It ends with you and me.” They kiss passionately. Angela rides up to the couple and tells Dolores they’ve found it. Dolores tells Teddy she needs to show him the truth. Charlotte explains that Delos won’t send an extraction team until they find Peter Abernathy. Bernard tells Charlotte he can find him using the ‘mesh network’. It’s a system that connects all the hosts subconsciously to keep their narratives from colliding. While Charlotte is changing clothes, Bernard’s hands start shaking. He runs a diagnostic test on himself and sees he is entering a death subroutine. He has white fluid coming out his ear. He draws fluid out of a host on the table and injects it into himself. There are some more glitches and Bernard finds himself back with Stubbs and Strand. They are back at the massacre site. They find Ford’s body with maggots coming out of his eyes. They drive out looking for the other hosts and find a sea that wasn’t there before. Costa goes to the edge of the cliff and sees a large number of hosts floating. They go down to the sea edge. Halstrand: “I can’t imagine what you went through here, Bernard, but there are hundreds of guests left up there and they need my help, which means I need yours. Can you tell me what happened?” Bernard: “I killed them. All of them.” One of the drowned hosts looks like Teddy. The hosts are achieving consciousness and they are looking for payback for the abuse they received from the guests. To MIB’s delight, but to the horror of the rest of the guests, the violence is real and lethal. Guest and host bodies’ liter the park. When Bernard wakes up on the beach, it has been two weeks since the uprising started. You wonder what took so long for them to show up, but we learn that the rescue mission was put on hold until Peter Abernathy is delivered. I guess we can assume that Bernard and Charlotte found and delivered him. If you noticed, Charlotte wasn’t on the beach with Bernard and Stubbs. Bernard is glitching and losing time. Last season it was Dolores as the unreliable narrator, this season it looks like it will be Bernard. Maeve rescued Lee, and along with Hector will be looking for her daughter. The three of them together should guarantee some much needed laughs for the show. With Maeve threatening Lee, Lee being an untrustworthy weasel, and Hector being Hector, it should be a fun trip. Dolores is with Teddy and she is enacting revenge and being long winded about it. As most future dictators, she loves the sound of her own voice. Dolores has big plans, not only for Westworld, but for the entire world. All hail supreme leader Dolores. MIB is still being the sadistic SOB he has always been. He now has the game he has wanted, someone should tell him be careful what you wish for, you might get it. 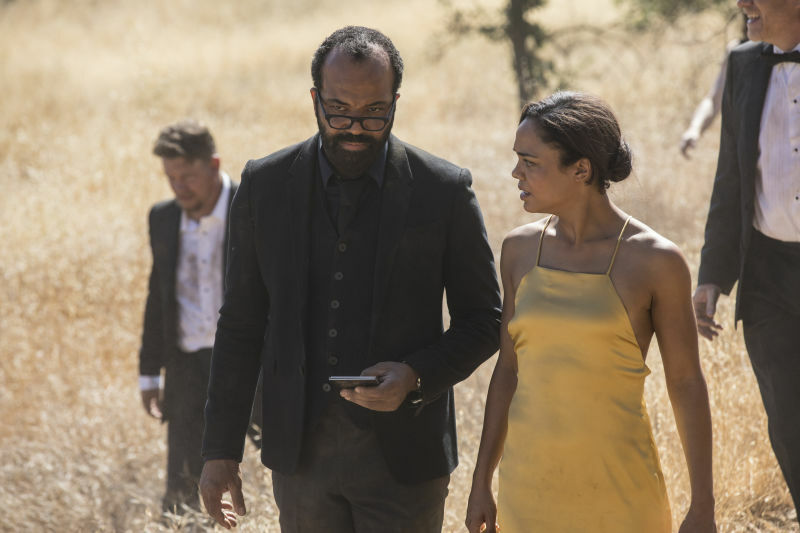 War has begun on Westworld and they aren’t skimping on the blood and gore. The maggots crawling out of Ford’s eye was a nice touch. It might be a bit too gratuitous, but this show doesn’t believe in restraint. It was good seeing the gang again. The episode did a good job of setting up the storylines for the season. We have the mystery of what is going on with Bernard. We’ll be switching to different timelines with him. We should find out what Delos is really up to in the park. Maeve will be looking for her daughter. MIB will be looking for the door. Dolores will be looking for revenge and world dominance. It should be a goodtime for all. The production value on this show is top notch as always. Here is a clip of how they created the creepy host drones. Since the host can inflict real damage, the action felt more intense than last season.